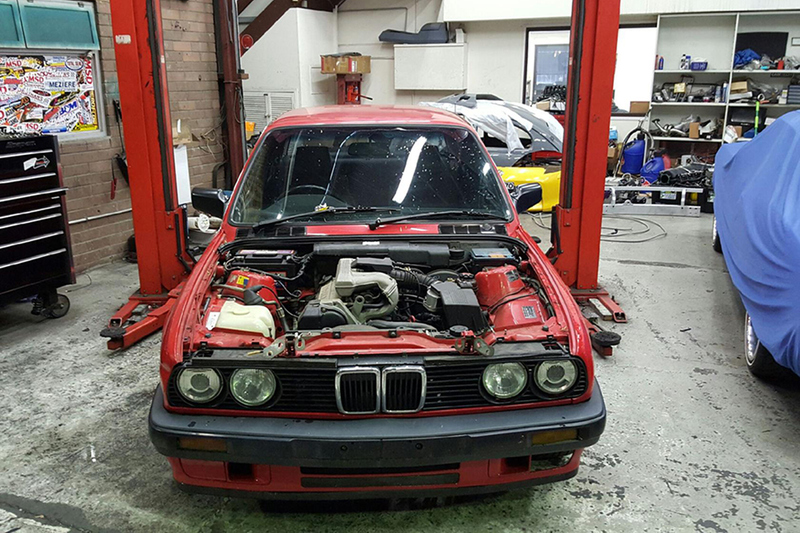 When he was doing the LS swap into his BMW E30, John Eifes didn’t take many pictures, but the ones he did take show us some important things about this type of swap. All images courtesy of John Eifes. John Eifes is an Australian from Sydney whose father and uncle own and operate an automotive repair shop that also specializes in building race cars. The shop’s name is CV Performance. Until recently, John had no interest in the family business. He was the bar supervisor for a popular nightclub in the city. Then, he decided to do some mods on his daily driver – a VW Polo. He enjoyed himself doing it, but not enough to quit his job at the bar. That might have been it for this story, but then John decided he wanted more power than the Polo could offer. One day, out of the blue, he found a great deal on a BMW E30, something he’d always wanted to have. So, he pulled the trigger and spent the $2000 on it. 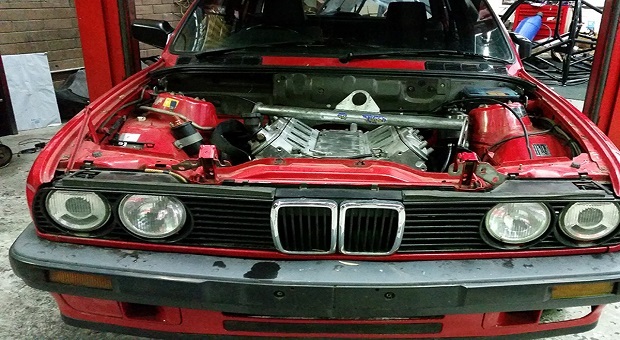 He decided that it needed more power, and his dad and uncle convinced him to save his pennies and do an LS swap on it. That’s when the love affair began. He’s now the manager at the shop and the proud owner of a BMW E30 with a nice, high performance LS engine and he hasn’t looked back. The inline six in John’s BMW looks anemic when compared to the engine in the photo above. BMW’s E30 is one of their Three-Series cars. John’s had the straight six 2.5L engine. Backing that was a three-speed automatic. The rear end was the 4.10 viscous-coupled limited slip version. The body and paint were pretty clean, so he didn’t need to do anything but polish it and add some graphics. No, I don’t mean he had some sort of disease. Sikky is the maker of a wide variety of LS swap kits for almost any import car out there. One of those was John’s E30. Something different about the Sikky kits from others we might be used to is that they don’t stop with just motor mount adapters and maybe headers. These guys go all out: Driveshaft and intake manifold are included. Also unlike most LS swap kits I’ve seen recently is the fact that Sikky kits are built to take the T56 manual transmission instead of either GM’s fL60E or 4L80E automatics. Another thing that’s different is that buyers have options to choose from. You can go with either urethane motor mounts for mild engine combos or you can choose solid motor mounts for wild motors. You’ve also got your choice of steel or aluminum manifolds. Thinking of going turbo? IF you get your headers with you Sikky LS swap kit, you can choose from either 1-3/4 inch or 1-7/8 inch header pipes. There’s also your choice of three optional LS1 or LS3 intake manifolds. Alas! 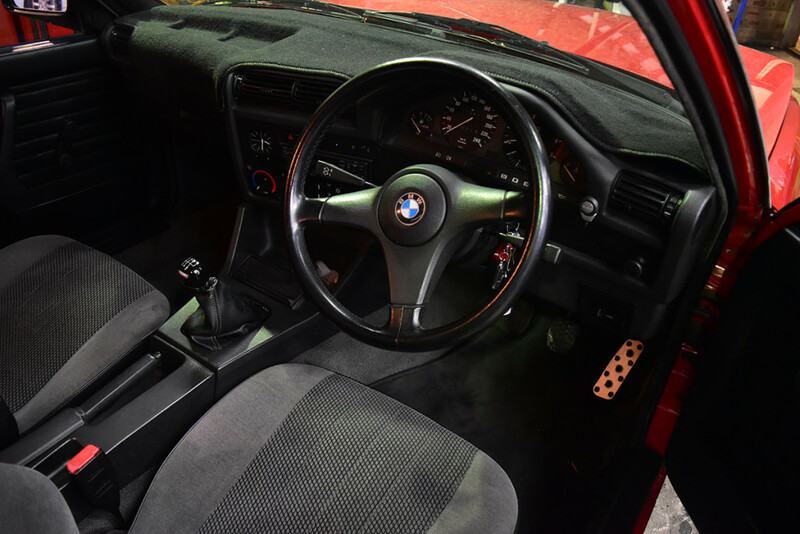 John’s BMW Is Right Hand Drive! 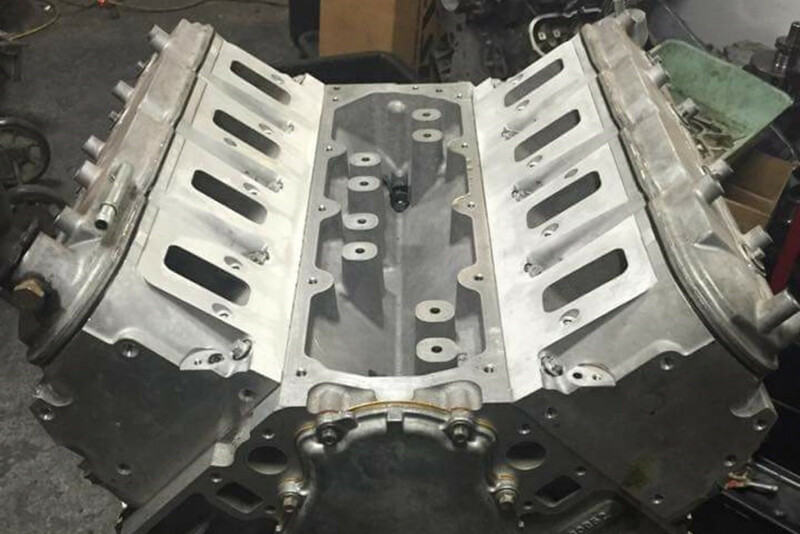 A custom oil pan had to be fabricated by hand for the 6.2 L LS3. John’s BMW is an Australian car, which means that instead of driving from the correct side of the car, he has to drive from the right side of the car (the passenger side!). This means that the motor mount adapters, oil pan sump, the oil filter relocation kit, and the tailshaft that came with the Sikky kit didn’t work for him. 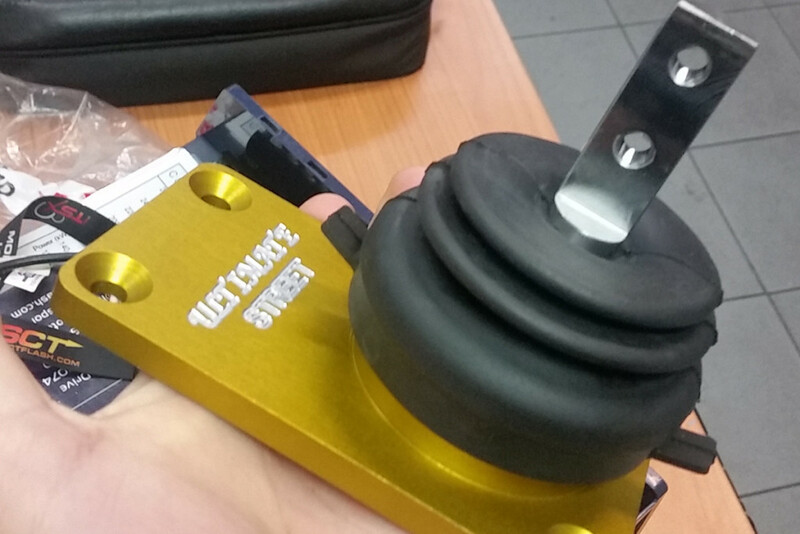 They also had to fabricate their own transmission mounts for the 2004 T56 manual gearbox he installed. The trans mounts that were made for the T56. John was impressed with the LS swap kit. This, even though he wasn’t able to use around half of it because of the way his car is made. He said the billet motor mounts look amazing. Remember at the beginning of this story, John said he wanted more power than the VW he had could deliver and even the power from the BMW’s 2.5 wasn’t enough. He wasn’t going to settle for any measly 4.8 or 5.3 liter engine. No sire, he went all out and picked up a Gen III 6.2 LS3 out of a Holden from a junkyard. Once they got this to the shop, they proceeded to strip it down and completely recondition it. 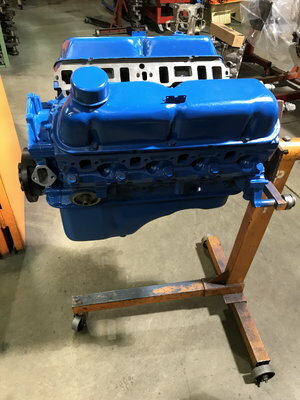 The guys in the machine shop put a one-off grind on one of their sweet cams for him, and they used heavy duty Manley springs to keep the valves from floating. 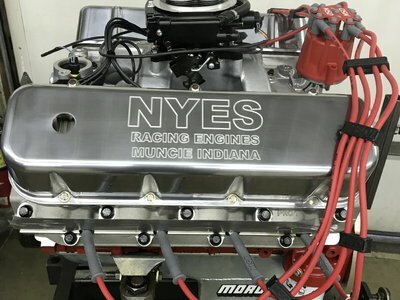 Once assembled, they put the engine on the dyno. The result? An impressive 520 horses. 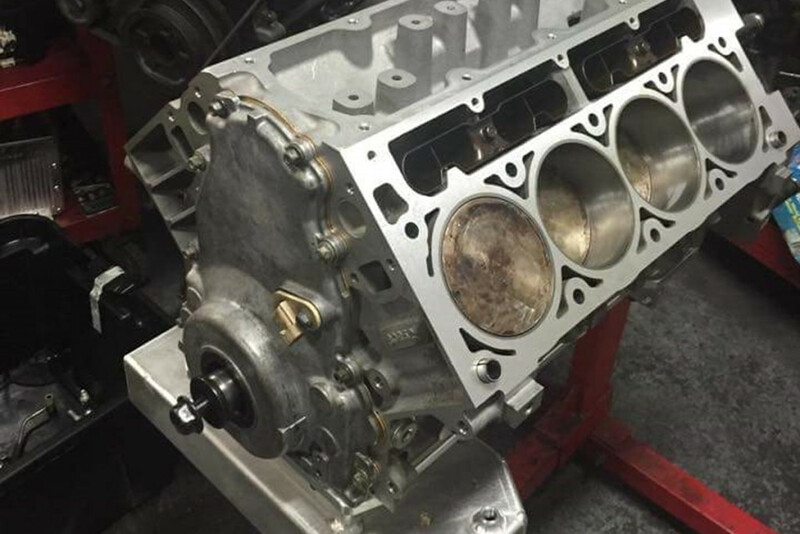 The short block after rebuilding. I’ve spoken with a number of people that have swapped LSx motors into their cars and even the guys who have done it with big engine bay GM products have had problems with fitment. 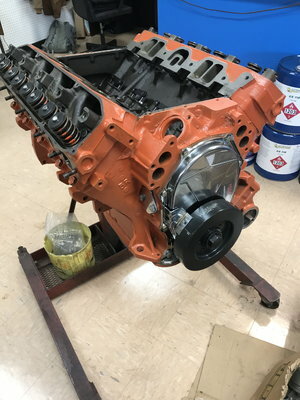 John said that one of the first things they did after receiving and installing the swap kit was to test fit the engine with the trans bolted to it. He said that other than a little reshaping of the trans tunnel, it went in like a hot knife through butter. They were happily surprised to see that they didn’t even need to do any major mods to get the shifter for the manual trans to fit, it went right in perfectly. The only real problem they had was the fact that he was installing a manual transmission in a car that was previously equipped with an automatic. Finding a manual trans pedal setup for the E30 was not fun I was told. They installed a short throw shifter assembly that John tells me cost him almost as much as the junkyard transmission did. The short throw shifter that was installed. It goes without saying that the BMW ECU wouldn’t talk with the LS3 ECM. John went down to the local junkyard and picked up the ECM out of 2005 Holden. However, this was a drive by wire setup and the BMW, well, isn’t. So, this meant that they also had to pull the pedal assembly out of the Holden, remove the manual trans pedal assembly they had already installed. They then removed the accelerator pedal from this and modified the Holden throttle pedal to mount to the firewall and work properly with the BMW pedal assembly with no binding or hangups. When ordering the Sikky LS swap kit, they specified the LS3 speed density intake manifold with the injectors and fuel rail already installed. This meant that once they upgraded the fuel delivery system, i.e. the pump, it was basically plug and play. They went with the Walbro 460 pump, which was a drop-in model and a piece of cake to install. The pump draws such low current that they were able to use the factory wiring. The manual transmission necessitated another set of modifications beyond the pedal assembly. They had to install a set of linkage to a clutch master they installed on the firewall. From there, they fabricated new hard lines down to the clutch fork and installed the slave cylinder. This image shows the new throttle and clutch pedals that were installed. 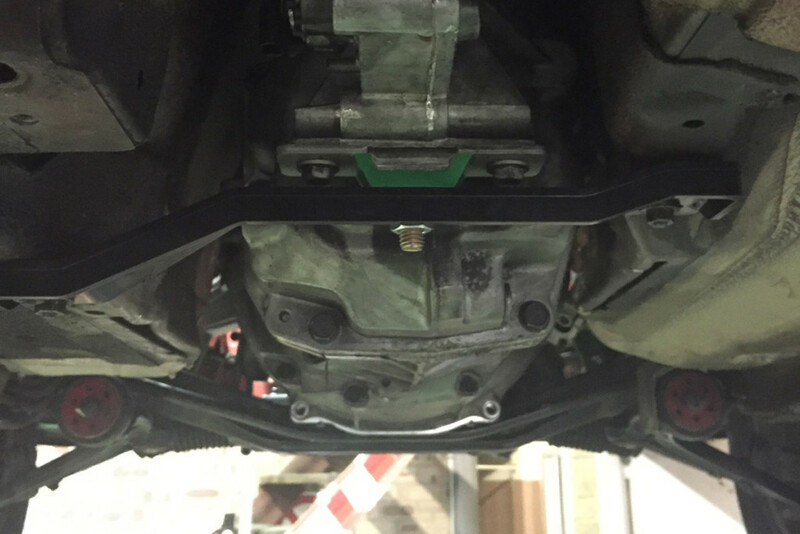 It also shows how the transmission was perfectly located for the stock shifter opening. The 6.2 that was installed is, as you can imagine, significantly bigger in all aspects than the 2.5 that was originally in the car. 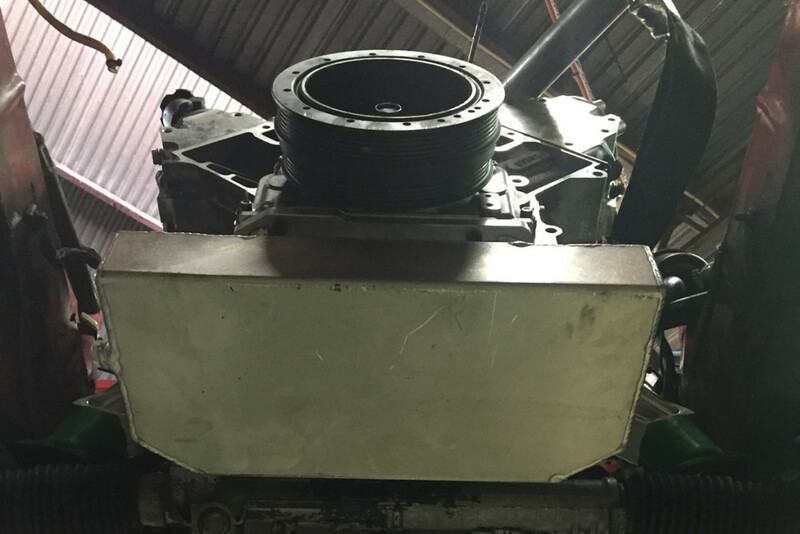 When they pulled that, they also pulled the brake master cylinder, just to make the removal of the old engine and installation of the new engine a little easier. However, when they went to reinstall the master cylinder, they discovered that the Bank 0 head (Driver side in the US) was occupying the space the master and booster wanted to be in. This necessitated the purchase of a remote master and brake booster. These were mounted in the left front behind the headlight assembly. John’s working on saving money to upgrade the rest of the brake system. We’ll update you when that happens. They’re currently using the stock radiator, although a custom radiator is being fabricated for the car at this time. There isn’t enough room to run a mechanical fan, so a SPAL 3000 CFM electric fan was used instead. Although he really hasn’t gotten onto it yet, he says this combo seems to be working to keep the engine cool for the moment. Obviously the inline six exhaust wouldn’t work for the LS3 engine. Also, they couldn’t go with just any LSx headers out there; they had to be something special for this special BMW. They ended up deciding on a pair of genuine HSV headers. They had to do a little reshaping on the driver side (passenger side in the US) to get it to fit around the steering rack, but other than that, it too went right in. They then sent the car over to an exhaust specialist who custom-crafted a three-inch dual exhaust system for the car. John doesn’t know what the car will do at the track yet because he hasn’t been able to swap out the stock BMW 4.20 rear end. He knows that if he tries, he’ll leave that out on the track and he doesn’t want to do that. Once he has the money for it, he’s going to swap that out for a 3.70 limited slip diff because they’re fairly light. John says that even though he really can’t get up into the guts of the engine yet and see what it can do, he’s still having loads of fun with it out on the roads of the Outback.